Trams make an important contribution to public transport in the city of Zürich in Switzerland. 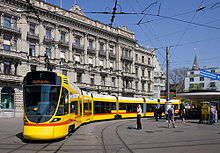 The tram network serves most city neighbourhoods, and is the backbone of public transport within the city, albeit supplemented by the inner sections of the Zürich S-Bahn, along with urban trolleybus and bus routes as well as two funicular railways and one rack railway. The trams and other city transport modes operate within a fare regime provided by the cantonal public transport authority Zürcher Verkehrsverbund (ZVV), which also covers regional rail and bus services. The city's trams are operated by the Verkehrsbetriebe Zürich (VBZ), which also manages the tramway infrastructure within the city, but the city's tram tracks are also used by two other operations. The Glattalbahn tram services to the Glattal area to the north of the city interwork with the city tram services and are also operated by the VBZ, although in this case it does so as a sub-contractor to the Verkehrsbetriebe Glattal (VBG). Trains of the independent Forchbahn (FB) light railway also use the city's tram lines to reach their city centre terminus. Trams have been a consistent part of Zürich's streetscape since the 1880s, when the first horse tram ran. Electrified from the 1890s, they have seen off challenges including proposals to replace them by trolleybuses and by a metro or U-Bahn. With a relatively static city network from the 1930s to the late 1970s, the city's trams have been expanding again since then. Recent expansions have taken the network into the suburbs beyond the city boundary, covering areas it retreated from in the first part of the 20th century. Further extensions have been approved, both to the city tram network itself, and by the introduction of a new light rail system in the Limmat Valley that will interwork with the city trams. Various projects to introduce trams to Zürich were proposed from the 1860s onwards. It was not until 1882, however, that the first tram operated in the city. These initial trams were operated by the Zürcher Strassenbahn Gesellschaft [de] (ZStG), a private company, and were of standard gauge (1,435 mm or 4 ft 8 1⁄2 in gauge) and horse-drawn. By 1888 the first electric tramway in Switzerland (the Vevey–Montreux–Chillon tramway) had opened, and, in 1894, another private company, the Elektrische Strassenbahn Zürich [de] (EStZ), started operating metre gauge (3 ft 3 3⁄8 in gauge) electric trams in Zürich. The EStZ only survived for two years before it was taken over by the City of Zürich, who renamed it the Städtische Strassenbahn Zürich (StStZ). The following year, the horse trams of the ZStG were acquired. Further tramway companies were founded, some operating entirely within the city, some connecting the city with its nearer suburbs, and some running in rural areas entirely beyond the city, but still linked by connections with other lines to the city. Like the EStZ, all these lines were electrified and were built to the metre gauge. The StStZ gradually took over those companies that had significant city operations, usually closing any cross-boundary lines, whilst leaving those lines entirely beyond the city to their own devices. The many companies that operated trams in and around Zürich are summarised in the table below. Names of companies whose lines were entirely outside the current city boundaries are shown in italic type, and those which still operate tram or other light rail services are shown in bold type. Zürcher Strassenbahn Gesellschaft [de] ZStG 1882 1897 StStZ The private company that opened Zürich's first tramway, using horse-drawn standard gauge (1,435 mm or 4 ft 8 1⁄2 in gauge) trams. Elektrische Strassenbahn Zürich [de] EStZ 1894 1896 StStZ The first electric tram operator, and the first to use metre gauge (3 ft 3 3⁄8 in gauge). Bought by the City of Zürich, and renamed the StStZ. Zentrale Zürichbergbahn [de] ZZB 1895 1905 StStZ Constructed two electric tramways from near the current Kunsthaus to the Kirche Fluntern and to the lower terminus of the Rigiblick funicular. Their trams operated through to Paradeplatz over StStZ tracks, and were eventually acquired by that company. Städtische Strassenbahn Zürich StStZ 1896 1950 VBZ Formed by the City of Zürich to buy the EStZ. The city owned company continued to acquire other tram operators, until by 1931 it owned all the remaining tramways within the city. In 1950, renamed as the VBZ. Strassenbahn Zürich-Oerlikon-Seebach [de] ZOS 1897 1931 StStZ Constructed a tram route from Leonhardsplatz (now known as Central) to Oerlikon and Seebach via Stampfenbachstrasse and Schaffhauserstrasse. Later additions included an extension from Seebach to Glattbrugg, and a route from Oerlikon to Schwamendingen. An early connection to the StStZ network was soon removed, and the ZOS operated independently of the city trams until the company was taken over by them in 1931. At the same time, the Oerlikon to Schwamendingen and Seebach to Glattbrugg lines were closed. Industriequartier-Strassenbahn Zürich [de] IStB 1898 1903 StStZ Constructed a tram route from Bahnhofquai to Escher-Wyss-Platz. At Escher-Wyss-Platz, connection was made with the StZH route to Höngg, and initially cars ran through from Bahnhofquai to Hongg. However this ceased after 1901, and passengers needed to change trams and rebook at Escher-Wyss-Platz. The company was taken over by the StStZ in 1903, after which through running to Hongg resumed. Strassenbahn Zürich–Höngg [de] StZH 1898 1923 StStZ Constructed a tram route from Escher-Wyss-Platz, with connection to the IStB line to Bahnhofquai, via Wipkingen to Hongg. The line was acquired by the StStZ in three phases; firstly in 1907 when the bridge over the Limmat river to Wipkingen was replaced, then in 1913 when the line as far as Grenzstein Honng was acquired, and finally in 1923 when the rest of the line as far as the terminus at the Wartau depot was acquired. Dolderbahn Db 1895 From 1899, the Dolderbahn company operated an electric tram between the upper station of the Dolderbahn (then a funicular) and the Dolder Grand Hotel. This line never had any track connection with any other tram line, and was replaced by a bus in 1930. In 1973 the Dolderbahn was converted to a rack railway and extended to the Dolder Grand, thus replacing the bus. Limmattal Strassenbahn LSB 1900 1931 StStZ Constructed an interurban line from the former Zürich city boundary at Letzigraben, via Altstetten (Farbhof) and Schlieren to Dietikon, together with a branch from Schlieren to Weiningen. A connection with the StStZ was made at Letzigraben. The line between Schlieren and Dietikon closed in 1928, whilst that Schlieren and Weiningen closed in 1931, at the same time as the rest of the line from Letzigraben to Schlieren were acquired by the StStZ. Bremgarten-Dietikon-Bahn BD 1902 2000 BDWM Originally constructed as a rural tramway between Bremgarten and Dietikon to the west of Zürich. Althyough well outside the city of Zürich, it was at one time indirectly connected to the city's tramways by the LSB, which also served Dietikon. The section between Bremgarten and Wohlen was originally a standard gauge steam operated railway, which was converted to mixed gauge and taken over by BD in 1912. Albisgütlibahn [de] AGB 1907 1925 StStZ The last privately owned tramway to be built within the city was built to connect the city tramway at Giesshübelstrasse to the site of the federal shooting festival, held at Albisgüetli [de] in July 1907. Lack of traffic to this, then very rural, location after the festival finished caused the line financial troubles, and in 1913 the line sold three of its five trams to the StStZ. By 1915 the line was operating only on Sundays, and in 1925 the StStZ took over. Wetzikon-Meilen-Bahn WMB 1909 1950 (closed) A rural tramway linking Kempten, Wetzikon and Langholz [de] to the east of Zürich with Meilen on the shores of Lake Zürich. Well outside the city of Zürich, it was at one time indirectly connected to the city's tramways by the UOeb, with which it connected at Langholz, and hence the FB. Uster-Oetwil-Bahn UOeB 1909 1949 (closed) A rural tramway linking Uster, Esslingen, Oetwil am See and Langholz [de] to the east of Zürich. Well outside the city of Zürich, it was at one time indirectly connected to the city's tramways by the FB, with which it connected at Esslingen. Forchbahn FB 1912 A line linking line Zürich with the towns of Esslingen and Forch. The line opened in 1912 as a rural tramway connecting at Rehalp with the city trams, with inter-running as far as the city centre. The line has since been rebuilt with more railway characteristics, and quite substantial trains, but these continue to operate across the city tram network between Stadelhofen in the city centre and Rehalp. Verkehrsbetriebe Zürich VBZ 1950 Owned by city of Zürich. BDWM Transport AG BDWM 2000 Created by amalgamation of the BD with the bus operator WM. Still operates a light rail service between Dietikon and Wohlen, but is no longer connected to the Zürich tram system. By the mid-1930s, the StStZ had acquired all the companies that had operated tramways within the city boundaries, with the single exception of the Dolderbahn, which had closed its short tramway in 1930. The standard gauge horse tram lines had all been converted to metre gauge and electrified. The StStZ had also built many tram extensions, resulting in a dense network of tramlines serving most city neighbourhoods. However, in 1927, the StStZ had introduced its first motor bus route, and this was to be followed in 1939 by the first of the city's trolleybus routes. Initially these modes complemented the trams, but at various times they have threatened to replace parts of the tram system, and sometimes succeeded in doing so. In 1940, the StStZ started a modernisation of its trams, introducing the first prototypes of the Swiss Standard Tram [de; fr]. Despite Switzerland's neutrality, the economic effects of the second world war slowed down the program, but by 1953 the VBZ, as the StStZ had become in 1950, had taken delivery of 177 such trams. The Schlieren to Dietikon and Schlieren to Weinigen lines of the LSB company, closed in 1928 and 1931 respectively. The Oerlikon to Schwamendingen and Seebach to Glattbrugg lines of the ZOS company, closed in 1931. The Uster to Langholz line of the UOeB company, closed in 1949. The Wetzikon to Meilen line of the WMB company, closed in 1950. In the city, the initial threat to the tram came from its perceived inflexibility and susceptibility to the growing traffic congestion in the city streets. One proposed solution was the conversion of the less busy lines to trolleybus routes, and the first step in this direction was the conversion of tram route 1, from Burgwies to Hardplatz (1954-1956). This was followed by the Farbhof to Schlieren section of route 2 (1956-8) which became a westward extension of the same trolleybus route. In practice, the trolleybus service struggled to cope with peak loadings and punctuality did not improve. No further conversions of tram routes to trollybuses have taken place. In the 1950s, as well as proposing the conversion of less busy lines to trolleybus, plans were also made to place the busier lines in tunnel, in a form called the Tiefbahn. The recently delivered Swiss Standard trams were not seen as suitable for this, because they had doors on their tapered car ends that would not have aligned with the proposed underground station platforms. In order to overcome this limitation, several new designs of tram were introduced. The first design, known as the P16 or Karpfen, could not run on some existing routes, and only one batch of 15 motor tram and trailer pairs was built. A later design, which used articulation to avoid the problems of the P16, was eventually more successful and 126 vehicles were delivered by 1969. This car became popularly known as the Mirage. Despite the planning and new rolling stock, a referendum in 1962 rejected the Tiefbahn. However the proponents of going underground instead proposed a full scale metro, the Zürich U-Bahn system. This would have been standard gauge and electrified using a third rail, and hence incompatible with the tram system. The lines would have extended further into the suburbs and provided faster transit times than the tramways, which would have been curtailed so as not to compete with the U-Bahn. However this would have been at the expense of a coarser grained network, with much longer distances between U-Bahn stations than between the tram stops they replaced. In 1973, the U-Bahn proposal too was rejected in a referendum, but not before several stretches of U-Bahn tunnel had been built. One section of the putative U-Bahn has since been adapted, as described below, for use by trams, whilst another now forms the terminus of the Uetliberg and Sihltal railway lines under the Hauptbahnhof. In 1976, the first tram extension since 1954 took place, with the extension of route 4 from Hardturm to Werdhölzli. Unlike the older lines, this extension was built mostly on reserved track, a precedent to be followed by most subsequent extensions. The Werdhölzli extension was followed in 1986 by the extension of routes 7 and 9 into new residential areas to the north-east of Zürich. This used one of the stretches of tunnel that had been built for the rejected U-Bahn, between Milchbuck and Schwamendingen. The tram route was extended through the tunnel before splitting at Schwamendingen to serve the area beyond, using new surface track. Because the tunnels and stations had been built with island platforms, whilst Zürich trams only have doors on their nearside, the section through the tunnel uses left-hand running. From 1976 onwards, the VBZ tram fleet was further updated, with the introduction of Zürich's variant of the Tram 2000 design used by several Swiss tram systems. Several sub-classes of the Tram 2000 were purchased, including articulated and non-articulated variants, and some without drivers cabs that could only operate in multiple with other cars. Eventually 171 of these vehicles were delivered, with the last of the class delivered in 1992. From the 1980s onwards, the system was increasingly acclaimed for its success in maintaining a high share of the modal split, and the Zürich model of transport provision was named after it. Beyond the tramway, the Zürich S-Bahn rail network was introduced to serve the region beyond the city boundaries, taking on some of the role that was originally planned for the U-Bahn. In 1990, the city's urban and regional transport were integrated by the introduction of the ZVV and its zone-based common fare structure. In 2001, the VBZ took delivery of the first prototypes of a brand-new low-floor design of tram, known as the Cobra. Despite many teething problems with the prototypes, which were eventually extensively rebuilt, there are now 88 of these trams in service, with the last delivered in 2010. In order to increase the number of low-floor trams in service, 23 trams from the otherwise high-floor Tram 2000 fleet were rebuilt between 2001 and 2005 with the addition of a low-floor centre section. From the 1950s onwards, the Glattal region to the north of Zürich experienced a rapid boom as population and industry spilled over from nearby Zürich, partly driven by the presence of Zürich Airport. Whilst the airport is served by the city's S-Bahn rail network, the economic growth and resulting congestion led to a need for a finer-grained form of public transport. The responsible transport authority (the Verkehrsbetriebe Glattal or VBG) responded by constructing a new light rail system, the Glattalbahn. This was built to be compatible with Zürich's tram network, with which it connects at several points on the city boundary. The system opened in stages between 2006 and 2010. The VBG contracted the VBZ to operate the network, and several tram routes now operate across both networks. "Tram Zürich West", an extension from Escher-Wyss-Platz to Bahnhof Altstetten Nord, in the city of Zürich, opened in December 2011. The resulting reorganisation of routes included a new route 17 from Hauptbahnhof to Werdhölzli via Escher-Wyss-Platz, and the diversion of route 4, which had previously served Werdhölzli, to Altstetten. In 2017, route 8 was extended from Hardplatz to Hardturm, via new track over Hardbrücke, the first tram line to cross the main railway line through Zürich. The arrival of new trams between 2001 and 2010 led to the departure of older vehicles. The Karpfen last ran in regular service in 2006, and the Mirage in 2010. Many members of both classes have been transferred to Vinnytsia in Ukraine. The Zürich Tram Museum, located at the former tram depot at Burgwies (on tram route 11), preserves many examples of Zürich's former tramcar fleet, along with other related exhibits. All journeys on routes 6, 10 and 12 are operated by low-floor trams, whilst at least every other journey on lines 2, 3, 4, 7, 9, 11, 13, 14 and 17 are provided by such vehicles. Most, but not all, tram stops are configured to allow passengers in wheelchairs to board low-floor trams. Of the three routes that operate in part over Glattalbahn tracks, routes 10 and 12 are operated by the VBZ on behalf of the Verkehrsbetriebe Glattal (VBG), normally using tramcars in the VBG's own predominantly white colour scheme, whilst route 11 is operated by the VBZ on its own behalf, normally using vehicles in its own livery. The independent Forchbahn (FB) railway uses VBZ trackwork to reach their city centre terminus, at Bahnhof Stadelhofen, from the eastern edge of the city, at Rehalp. The FB trains operate largely in the street for this section of their route, sharing track with VBZ tram routes, but are categorised as route S18 of the city's S-Bahn railway network rather than as part of the tram network. Beyond Rehalp the trains use the FB's own segregated tracks to reach their outer terminus at Esslingen. On the last weekend of each month, the Zürich Tram Museum operates tram route 21 from the city centre to the museum at Burgwies (up to Rehalp at Saturdays), using their own heritage rolling stock. Zürich's tram network is built to metre gauge (3 ft 3 3⁄8 in gauge). There are 171.9 kilometres (106.8 mi) of track, equating to a network length of 72.9 kilometres (45.3 mi) and a total route length of 118.7 kilometres (73.8 mi). The tracks are electrified using overhead line at 600 V DC, utilising a supply system shared with the city's trolleybus network. The VBZ infrastructure within Zürich is largely street based, with varying degrees of segregation from other street traffic and significant sections where trams run in unrestricted traffic lanes. In the city centre the tram tracks run through largely pedestrianised streets, and in one place in the suburbs the trams use a tunnel originally constructed for the never completed Zürich U-Bahn system. By contrast, on VBG infrastructure in the Stadtbahn Glattal, VBZ trams operate on long stretches of dedicated track. Many of Zürich's tram stops have been equipped with boarding platforms raised to match the floor height of the low floor trams, although there are still examples of stops where passengers must board from street level. Zürich's trams are single-ended, with doors on only one side, although Forchbahn trains are double-ended and double-sided. In consequence all terminal locations are equipped with turning loops, and all tram stops are to the nearside of the tram. Zürich's tram fleet is kept in the five operational depots of Hard, Irchel, Kalkbreite, Oerlikon and Wollishofen, together with a permanent way yard at Hardturm. Whilst these depots have the capability to undertake minor maintenance, heavier maintenance is the responsibility of the VBZ's central workshop at Altstetten. This is connected to the tram network, and also has a rail connection to the Swiss Federal Railway system, allowing the delivery of infrastructure items and vehicles by rail. In addition to the above depots and workshops, two other former tram depots, at Burgweis and Wartau, are also still connected to the tram network. Burgweis depot now houses the Tram-Museum Zürich main collection, whilst Wartau is used as a workshop by that organisation. The rail connections permit the occasional operation of preserved trams on the VBZ network. As of 2012, the VBZ owns 313 tram vehicles, which between them cover over 16 million vehicle-kilometres per year. All regular public services are covered by 289 vehicles of two basic classes, with the remainder of the fleet made up of a number of assorted works vehicles, including some used for the cargo tram service, and heritage vehicles. The heritage fleet sees occasional use on special services. 2001-2098 Tram 2000 Be 4/6 50/54 The two section articulated variant of the Tram 2000 design for Zürich, of which 98 vehicles were delivered in two stages from 1976 to 1978, and from 1985 to 1987. Each vehicle is 21.4 metres (70 ft) in length and 2.2 metres (7 ft 3 in) in width. In most cases these cars operate in multiple. 2099-2121 Tram 2000 Be 4/8 68/75 Originally two section units similar to 2001-2098, these cars were built from 1992 to 1993. Between 1999 and 2005 they were rebuilt with a third central low-floor section. Each vehicle is 28 metres (92 ft) in length and 2.2 metres (7 ft 3 in) in width. They are also known as Sänfte. 2301-2315 Tram 2000 Be 4/6 50/57 Two section articulated unit similar to 2001-2098 but without a drivers cab. These cars were built in 1978, and must run as the second unit in multiple with another Tram 2000 unit. Each vehicle is 21.4 metres (70 ft) in length and 2.2 metres (7 ft 3 in) in width. 2401-2435 Tram 2000 Be 2/4 35/41 Single section non-articulated unit without a drivers cab. These cars were built in two stages from 1985 to 1987, and 1992 to 1993. Like 2301-2315, they must run as the second unit in multiple with another Tram 2000 unit. Each vehicle is 15.4 metres (51 ft) in length and 2.2 metres (7 ft 3 in) in width. They are also known as Pony. 3001-3088 Cobra Be 5/6 90/113 The more recent of the two classes of trams in regular service are the 88 modern low-floor Bombardier Cobra trams delivered between 2001 and 2010. 18 of them (3062-3079) were in VBG livery. These are all five section articulated vehicles running on six pairs of wheels, of which five are powered. Each vehicle is 36 metres (118 ft) in length and 2.4 metres (7 ft 10 in) in width. Because of their length, Cobras only run as single units in normal service. Like the rest of the VBZ network, Zürich's tram network operates on a proof-of-payment system. All tram stops are equipped with ticket machines, and passengers are required to purchase a ticket before boarding the vehicle. Passengers may board through any door and are not required to show tickets on boarding. Instead, tickets are randomly checked by roving teams of fare inspectors, and fines are imposed on passengers found without one. Tram services are operated within the fare and ticketing system provided by the cantonal public transport authority, the Zürcher Verkehrsverbund (ZVV). This system covers the whole of the canton of Zürich and thus covers travel on other modes and services, provided by many other operators, and includes the Zürich S-Bahn suburban rail network. Free transfer is permitted between different vehicles, routes, modes and operators, provided a ticket valid for the whole journey is held. The ZVV system is zone-based, with fares for individual journeys set by the zones the journey passes through. The Zürich tram network extends over just two of these zones, with zone 110 covering the city routes, and zone 121 covering the Stadtbahn Glattal routes. Both single journey and day tickets are available, as are a number of passes with longer validities. Besides its passenger transport activities, VBZ, jointly with the city refuse and recycling department ERZ, operates the cargo tram to collect bulky waste. The cargo tram serves 10 different collection points around Zürich, calling at each on different days of the month. The collected refuse is taken to a specially constructed siding at the ERZ yard adjacent to the Werdhölzli tram terminus. The service was introduced in 2003, as an attempt to reduce the amount of bulky waste items dumped illegally every year. As Zürich has an extensive tram network serving most neighbourhoods, and many suitable sidings not used by regular services, it was decided to use the tram network. In its first year of operation it was responsible for the collection of 380 tonnes (370 long tons; 420 short tons) of waste. The collected waste is carried in two standard refuse containers, which are mounted on four-wheeled flat wagons. These are hauled by car 1922, a former Swiss Standard Tram, originally delivered to Zürich in 1940, and converted into a works car in 1980. The VBZ has long intended to order a new generation of tram cars, to replace the high-floor Tram 2000 trams currently in service. By 2010, it had conducted trials of three existing tram types on its network. These were the Stadler Tango, the Siemens Combino and the Bombardier Flexity. It then requested tenders for the supply of 30 new trams, together with an option for the supply of a further 70 vehicles. The first trams were to be delivered in December 2016, and were to be 100% low floor with capacity for at least 225 passengers. In response, by April 2013 five suppliers had submitted bids. As of February 2015, no decision had been made as to which supplier to select, with reports of conflict between city and canton authorities. In May 2016, it was announced that VBZ had awarded a contract worth 358 million Swiss Francs to Bombardier Transportation for the supply of 70 7-section Flexity 2 trams, with an option for a further 70, to be delivered between 2018 and 2023. The new trams will be 43 metres (141 ft) long and 2.4 metres (7 ft 10 in) wide, and be capable of carrying 90 seated and 186 standing passengers. Both Stadler Rail and Siemens filed complaints with the Administrative Court of the Canton of Zürich, causing the finalisation of the contract to be suspended, but the court ruled in February 2017 that VBZ could conclude the contract with Bombardier. After both Stadler and Siemens decided not to appeal this decision to the Federal Supreme Court of Switzerland, the contract was finally signed on 2 March 2017. Construction is planned to start in May 2015 on a line over the Hardbrücke between Hardplatz and the new Tram Zürich West branch at Schiffbau. This extension was approved by the city council on 20 March 2013, and by a referendum of voters in the canton on 30 November 2014. It will be served by extending route 8 from its existing Hardplatz terminus to Werdhölzli, and completion is expected in 2017. In the Limmat Valley, between Bahnhof Altstetten and Bahnhof Killwangen-Spreitenbach, the Limmattal light rail line is under construction and should be partially opened by 2020. A referendum, held in November 2015, approved the construction of the line, and it was announced in May 2016 that it would be operated by BDWM. The line will connect to the VBZ tram system at Farbhof, the current terminus of route 2, and that route will be extended over the light rail line as far as Schlieren, as a partial replacement for trolleybus route 31. There are also plans for a number of other extensions to be built up to 2025. ^ a b c d e f g h i j k "Gleisplan - Straßenbahn Zürich mit Glattal" [Trackplan - Zürich with Glattal] (PDF) (in German). 2014-01-23. Retrieved 2014-06-21. ^ a b c d "Startseite VBZ - Die VBZ - Porträt - Zahlen & Fakten - Linien" [Home VBZ - VBZ - Portrait - Facts & Figures - Lines] (in German). Stadt Zürich [City of Zürich]. Retrieved 2014-05-25. ^ "Startseite VBZ - Die VBZ - Porträt - Zahlen & Fakten - Fahrgastzahlen" [Home VBZ - VBZ - Portrait - Facts & Figures - Ridership] (in German). Stadt Zürich [City of Zürich]. Retrieved 2014-05-25. ^ Moglestue, Andrew (April 2005). "Zürich: Top city — thanks to light rail". Tramways & Urban Transit. Ian Allan Ltd / Light Rail Transit Association. pp. 130–134. ^ Moglestue, Andrew (May 2005). "Zürich: The Cobra rules, all above ground". Tramways & Urban Transit. Ian Allan Ltd / Light Rail Transit Association. pp. 180–184. ^ a b c d e f g h i j k Moglestue, Andrew (December 2005). "Zürich: A city and its trams". Retrieved 2011-08-10. ^ a b c d e f g h Eisenbahnatlas Schweiz. Verlag Schweers + Wall GmbH. 2012. pp. 64–65. ISBN 978-3-89494-130-7. ^ a b c d e f g h i j k l m n "Facts & figures - Corporate history". VBZ. Archived from the original on 2012-10-07. Retrieved 2012-05-26. ^ "Die Zentrale Zürichbergbahn (ZZB), 1894–1905" (in German). Tram-Museum Zürich. 2003-10-12. Archived from the original on 2011-09-01. Retrieved 2015-07-21. ^ a b "Die Strassenbahn Zürich – Oerlikon – Seebach (ZOS), 1897–1931" (in German). Tram-Museum Zürich. 2003-10-12. Archived from the original on 2011-09-01. Retrieved 2015-07-22. ^ "Die Industriequartier Strassenbahn (IStB), 1898 - 1902" (in German). Tram-Museum Zürich. 2003-10-10. Archived from the original on 2011-09-01. Retrieved 2015-07-22. ^ "Die Strassenbahn Zürich - Höngg (Z-H), 1898 - 1924" (in German). Tram-Museum Zürich. 2003-10-11. Archived from the original on 2011-09-01. Retrieved 2015-07-22. ^ a b "Die Limmattal - Strassenbahn (LSB), 1900 - 1931" (in German). Tram-Museum Zürich. 2003-10-10. Archived from the original on 2011-09-01. Retrieved 2015-07-23. ^ "Albisgüetli-Bahn". Bahndaten. ViaStoria - University of Bern. Retrieved 16 April 2014. ^ a b "Wetzikon-Meilen Bahn". www.eingestellte-bahnen.ch. Archived from the original on 2013-10-17. Retrieved 2013-10-09. ^ a b "Uster-Oetwil Bahn". www.eingestellte-bahnen.ch. Archived from the original on 2013-10-14. Retrieved 2013-10-11. ^ a b Wansbeek, C.J. (October 2003). "Glattal: High quality light rail to Zürich airport". Tramways & Urban Transit. Ian Allan Ltd / Light Rail Transit Association. pp. 374–376. ^ Moglestue, Andrew (December 2011). "Opening of Tram Zürich West". Retrieved 2012-05-27. ^ Moglestue, Andrew (November 2006). "Karpfen farewell tour". Retrieved 2012-05-26. ^ Moglestue, Andrew (June 2010). "Last Mirage day". Retrieved 2012-05-26. ^ Moglestue, Andrew (August 2010). "Karpfen and Mirage in Vinnitsa". Retrieved 2012-05-26. ^ "Stadt Zürich - Zürich City - Transport Map" (PDF). City of Zürich. Retrieved 2016-10-11. ^ "The Museum Line 21". Zürich Tram Museum. Retrieved 2012-05-09. ^ "Werkstatt" [Workshop] (in German). City of Zürich. Retrieved 2012-02-17. ^ a b c d e f "VBZ - Portrait - Facts & figures - Vehicles". City of Zürich. Archived from the original on 2012-10-07. Retrieved 2012-05-04. ^ "VBZ - Portrait - Facts & figures - Service". City of Zürich. Retrieved 2012-05-04. ^ a b c d "VBZ - Fahrzeuge - Unsere Fahrzeuge - Trams - Tram 2000" [VBZ - Vehicles - Our vehicles - Trams - Tram 2000] (in German). City of Zürich. Retrieved 2012-05-29. ^ "VBZ - Fahrzeuge - Unsere Fahrzeuge - Trams - Tram 2000 Sänfte" [VBZ - Vehicles - Our vehicles - Trams - Tram 2000 Sänfte] (in German). City of Zürich. Retrieved 2012-05-29. ^ "VBZ - Fahrzeuge - Unsere Fahrzeuge - Trams - Cobra" [VBZ - Vehicles - Our vehicles - Trams - Cobra] (in German). City of Zürich. Retrieved 2012-05-29. ^ "VBZ - Automatic ticket machine". City of Zürich. Retrieved 2012-05-21. ^ a b "VBZ - Fare zone system". City of Zürich. Retrieved 2012-05-21. ^ "Tarifzonen - Fare zones" (PDF). ZVV. Retrieved 2012-06-18. ^ "Cargo- und E-Tram" [Cargo- and E-Tram] (in German). City of Zürich. Archived from the original on 2012-08-29. Retrieved 2012-05-09. ^ a b c Moglestue, Andrew (August 2003). "Cargotram - Zürich's domestic refuse takes to the rails". Retrieved 2013-07-14. ^ Moglestue, Andrew (2014-01-14). "Cargotram serves additional destination". Retrieved 2014-02-06. ^ Moglestue, Andrew (April 2004). "Cargo tram is a success!". Retrieved 2013-07-14. ^ Moglestue, Andrew (June 2010). "Tango, Combino or Flexity?". Retrieved 2013-05-22. ^ Moglestue, Andrew (November 2012). "New tram order: The ball is rolling". Retrieved 2013-05-22. ^ Moglestue, Andrew (April 2013). "Five suppliers vie for tram contract". Retrieved 2013-05-22. ^ Moglestue, Andrew (February 2015). "More gloom over tram order". Retrieved 2015-03-02. ^ "So sieht das neue Züri-Tram aus" [Looks like the new Zürich tram]. Tages Anzeiger (in German). 17 May 2016. Retrieved 17 May 2016. ^ "Zürich orders 70 Flexity 2 trams". Railway Gazette. DVV Media UK Ltd. 18 May 2016. Archived from the original on 18 May 2016. Retrieved 18 May 2016. ^ "Trambeschaffung: Keine aufschiebende Wirkung der Beschwerden" [Tram procurement: No suspensory effect of the complaints] (in German). City of Zürich. 21 February 2017. Archived from the original on 27 February 2017. Retrieved 27 February 2017. ^ "Vertrag unterschrieben" [Contract signed] (in German). City of Zürich. 2 March 2017. Archived from the original on 3 March 2017. Retrieved 3 March 2017. ^ Ammann, Christian (April 2017). "Zürich's Bombardier order confirmed". Today's Railways. Platform 5 Publishing Ltd. p. 16. ^ Moglestue, Andrew (March 2013). "City council approves Hardbrücke tram". Retrieved 2013-03-22. ^ a b Moglestue, Andrew (July 2013). "Vision 2030, looking at VBZ's plans for the future". Retrieved 2014-04-28. ^ Curtis, Malcolm (2014-12-02). "Work on new Zurich streetcar line set to begin". The Local. Retrieved 2014-12-17. ^ Moglestue, Andrew (March 2010). "Limmattalbahn". Archived from the original on 31 May 2018. Retrieved 31 May 2018. ^ Hotz, Stefan; Müller, André (22 November 2015). "Nur das Limmattal selbst stimmt gegen «sein» neues Tram" [Only the Limmattal itself voted against "its" new tram]. Neue Zürcher Zeitung (in German). Archived from the original on 28 February 2017. Retrieved 27 February 2017. ^ Zander, Corsin (13 May 2016). "Aargauer betreiben Zürcher Limmattalbahn" [Aargau company to operate Zürcher Limmattalbahn]. Neue Zürcher Zeitung (in German). Archived from the original on 28 February 2017. Retrieved 27 February 2017. Bernet, Ralph (2000). Trams in der Schweiz: von Basel bis Zürich: Strassenbahn-Betriebe einst und jetzt [Trams in Switzerland: from Basel to Zurich: Tramway Operators Then and Now] (in German). München: GeraMond-Verlag. ISBN 393278507X. Bodmer, Hans (2011). Das Tram in Zürich 1928 bis 1962 [The Tram in Zürich 1928 to 1962] (in German). Erfurt: Sutton Verlag GmbH. ISBN 9783866809291. Galliker, Hans-Rudolf (1997). Tramstadt: Verkehrsplanung, öffentlicher Nahverkehr und Stadtentwicklung am Beispiel der Stadt Zürich [Tram City: Transport Planning, Local Public Transport and Urban Development with the City of Zürich as an Example] (in German). Zürich: Chronos-Verlag. ISBN 3905312026. Wikimedia Commons has media related to Tram transport in Zürich. Zurich database / photo gallery and Zurich tram list at Urban Electric Transit – in various languages, including English.